We presume the SCOTT Bluetooth portable speaker was designed by a tech-y Picasso. 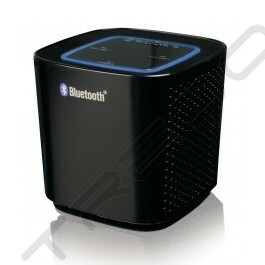 The cubism-inspired device streams your music via the magiv that is Bluetooth. If you don't have Bluetooth capabilities, you can aux input to connect your MP3 player and say good-bye to clunky power plugs when you can just charge your spekaer via USB. Known for it’s ingenious designs and smooth sound, Scott adds a portable Bluetooth speaker to its line of acoustic systems: the BT 700. This wireless music-box has an integrated 2.0CH speaker system, and built-in rechargeable lithium battery which allows you to jam to your playlist for six to eight hours. It can link up to just about anything that can connect to a USB or audio cable, and its petite frame makes it office-friendly. Adorable!